Just browse our website, and click on any items that you wish to buy and simply click "Add To Basket". Once you have finished selecting your items, click on "View Cart". From here, you can complete the Checkout process, where you will be asked for a few details that we need to be able to satisfy the order. 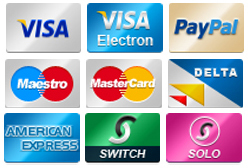 We accept Maestro, Switch, Solo, Visa, Visa Debit, Visa Electron, Mastercard, American Express and Paypal. You can also send your credit card information via phone, snail mail or over the Internet. Delivery is free of charge for all orders shipped to Zone A. We aim to dispatch all orders within 24 hours (working days). Although this is dependant on stock levels and our external courier service. If your order is not in stock or incomplete, we will order for you. We will advise you by E-mail if your delivery will be delayed by more than 7 Days. We will not charge your card if delivery is delayed by more than 7 days. All New goods are covered by manufacturers warranty unless stated. All goods are supplied with a return to base warranty. You can get in touch via the following ways:email us on saveltd@btconnect.com, or call on 01242 222721 or write to us at Sound And Vision Express Ltd, Mead Road, Cheltenham, Glos, GL53 7DU. "saveltd.co.uk" do not disclose buyers information to third parties. Cookies are used on this shopping site, but only to keep track of the contents of your Shopping Basket once you have selected an item.